Karlsruhe is one of the youngest of Germany's major cities – the city celebrates its 300th anniversary in 2015. The festivities celebrating this jubilee are an occasion for the Karlsruhe Baroque Orchestra to introduce this debut CD with selected works by directors of the court ensembles in Karlsruhe. In the 18th century, the musical life of Karlsruhe was nearly identical to that of the small court, where an ensemble of very high quality was developed with the help of less well-known composers including Johann Philipp Käfer, Johann Melchior Molter, Sebastian Bodinus and Friedrich Schwindl. Then, in the early 19th century, Baden became elevated to the level of a Grand Duchy due to Napoleon and gained a considerable amount of territory – the significance of the Baden court and its music increased correspondingly. Better-known musicians such as Franz Danzi and the violin virtuoso Friedrich Ernst Fesca also came to Karlsruhe during this period. 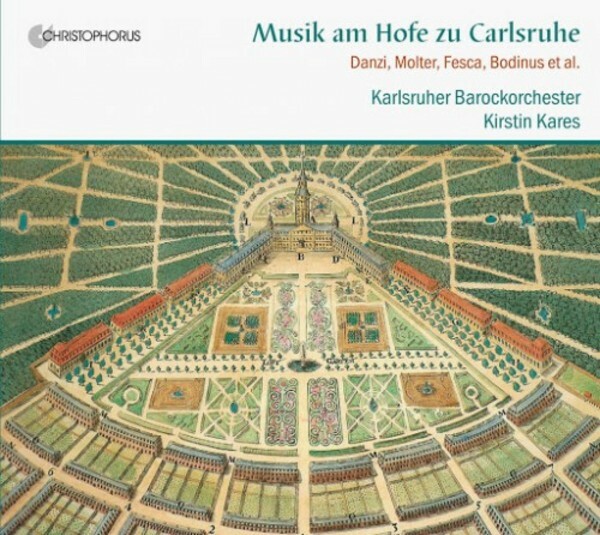 This CD is a wonderful compendium of over 200 years of Karlsruhe's musical history, extending from the origins of the Karlsruhe court in the Baroque period to its heyday in the 19th century. The ‘Karlsruher Barockorchester’ (Karlsruhe Baroque orchestra) under the direction of Kirstin Kares has excavated some magnificent works: with 'tympani and trumpets' and great musical verve, they present works of high musical value and outstanding representative quality, almost all of them premiere recordings. The musical tradition of Karlsruhe is thus resurrected in a completely new splendour.